Game Show Adventure turns your handheld device into an arcade video pub quiz machine. Inspiration for this quiz game came from popular TV game shows and video game machines that you would have seen down your local pub. 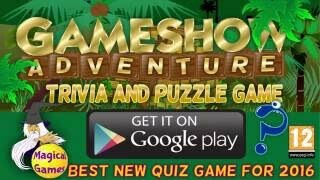 Random general knowledge quiz questions have to be answered against the clock with classic puzzles, word games and arcade games that also have to be completed to make your way to the top of the 3 pyramids, Aztec, Egypt and Vegas. This is not a casual game but an intelligent game of pitting your wits against a multitude of various brain teasers and puzzles, some easy, some are very hard. 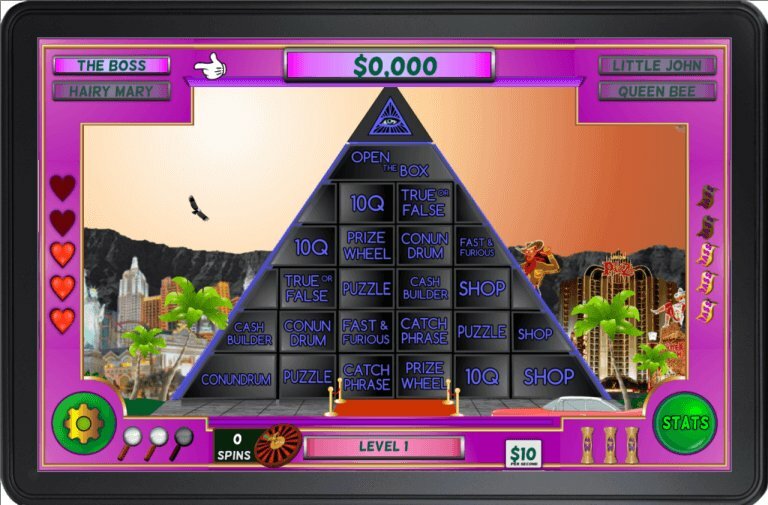 To help you climb the pyramid are passes, clues and extra time tokens and if used wisely they can greatly increase your chances of success. Nothing like this game has ever been created, it's addictive and can be frustrating but ultimately it's a lot of fun to play and will keep you coming back for more, time and time again. A fun game and a lot more rounds and puzzle types to keep you entertained than I expected when I downloaded it. It's also a lot more difficult than I thought it would be, which isn't necessarily a bad thing. My main criticisms would be that the graphics look pretty amateurish and this would probably put me off downloading it if I came across the game on Google Play and didn't have much more to go on than the screenshots and that the user interface is a bit clunky and feels annoyingly slow and unresponsive at times. Overall, a good effort that could do with a little more polish. The graphics are the best I can do, I'm not a graphic artist and can't afford to pay someone who is so the game will have to look the way it does for now, until it makes some money to re-invest on better graphics. Could you be more specific about the UI and where it is sluggish? I haven't come across this before and no-one else has mentioned it so I can fix it. Having played it again, I guess what I meant about the game feeling unresponsive was largely due to the unskippable animations that interrupted the flow of the game a bit for me. For example, when you open the 'X marks the spot' map, you have to wait for the map to (quite slowly) spin onto the screen, then it takes while for the x graphics to appear on the map, then you click an x and you have to wait for a couple of seconds while it flashes, then you have to wait again for the the prize to spin into view and so on. I'm probably just impatient, but I found myself tapping the screen quite a lot when I was playing, wanting to get on with it and nothing would happen until the animation was finished. As another example, I was in the shop and hit exit and for some reason it took about 5 seconds to go back to the main screen. I just think everything could do with speeding up a bit. Thanks very much for taking the time to point this out. I will definitely see what I can to speed things up with the treasure map. Going back to the main screen from the shop might be a bit tricky because there is a hell of a lot of stuff that has to be loaded but I will still see if I can shave some time off that part too. I will start work on this right away and hopefully have an update in the next day or so.